So it’s finally here. Mastering the Great Table is now available from Pendraig Publishing. Following the Enochian material that would become the Heptarchia Mystica, John Dee and Edward Kelley received a grid of letters called the Great Table that encodes a complex hierarchy of angels and demons, and a series of conjurations in the Angelic language called the Angelic Keys. These conjurations and the structure of the Great Table have inspired individual magicians and entire magical orders for centuries. 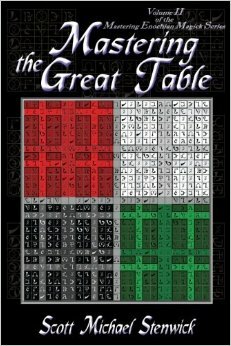 Author Scott Michael Stenwick now does for the Great Table what he did for the Heptarchia Mystica in the first volume of this series, presenting the material in a manner that is true to Dee and Kelley’s original schema along with a ritual template that includes both modern and traditional grimoire techniques. The entities of the Great Table possess a vast collection of powers well-suited to practical magical work, and have been employed in some of the most effective operations of the modern era. Unlock the secrets of the Great Table, and put them to work transforming your life. Where would be the best venue to order your new book? Sorry I missed this – I see that you posted over a month ago! Pendraig does most of their sales through Amazon, so that’s probably the easiest way to go at this point. If you really hate Amazon, though, it looks like you can also order my books from Barnes & Noble (http://www.barnesandnoble.com/s/stenwick?store=allproducts&keyword=stenwick) or Powell’s (http://www.powells.com/s?kw=stenwick&class=), though the latter is on the pricey side.